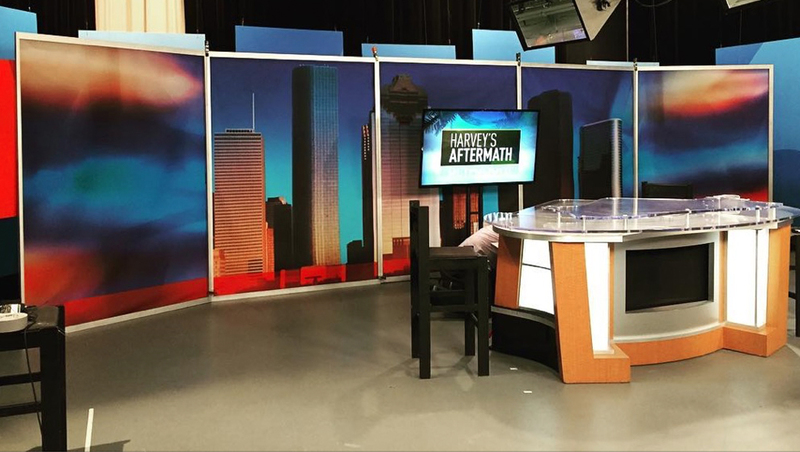 With its building and studio nearly destroyed from the flooding following Hurricane Harvey, the market’s CBS affiliate KHOU has moved to PBS affiliate KUHT and is using a piece of its past as a temporary setup. For a while, the station was using large blue and red ceiling mounted panels as its set, along with a video panel on a rolling cart. 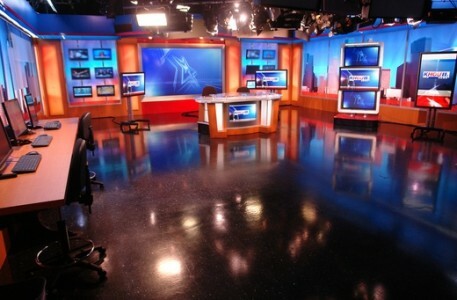 Now, however, Houston viewers are being treated to a somewhat more familiar look — parts of the station’s old set have been brought into the studio, including the old anchor desk and framed printed backgrounds. Based on photos of the old studio, it appears the station is using some of the segments from the side wall as well as the colorful collages form behind the monitor arrays (though sans the actual monitors). The graphic panels, which previously sat atop a knee wall, now sit directly on the floor, while the outermost panels are angled inward slightly. Parts of the blue and red panels are also visible, at least in wide views, behind the makeshift wall. The old set, from FX Design Group, was installed in 2011 and replaced in late 2016 with an “in the round” style design from Jack Morton PDG.